Many women work in enablement functions inside a business. You know, roles such as sales support, customer support, management support, human resources, marketing support, back end finance or procurement. Unfortunately these roles are perceived as the opposite of those at the pointy end of the business with direct P&L responsibility. So regrettably, they are typically the first to go with budget cuts, redundancies and efficiency dividends. Just like trying to fill the bathtub with the plug out, organisations who have diversity targets in place but aren't really focused on cultural change within the organisation to ensure women are included in pointy end business decisions, are losing women at the rate of knots, despite best intentions! So what can you as an individual do? Flick the switch - from enablement to optimisation. A simple change in language could make all the difference by helping both you and the rest of the business to see yourself and the value of your work differently. Enablement sounds like a "helper" personal brand, always playing second fiddle. Optimisation sounds as though it delivers a far better Return On Investment (ROI). Quantify the value and ROI you do deliver - in language and measures the pointy ends of the business understand - regularly, visibly and transparently. After all it costs 4 x more to recruit & train a new staff member than retain and old one. Plus it costs 7 x more to purchase a new customer than retain an old one. Keep ready reckoners close to hand, and claim market share where possible for the part your division plays in the success of a project or the business overall where possible. Don't be shy and don't sell yourself short. Back yourself and sell your ideas in ways the business will hear and understand. Dare to challenge the rest of the business to do things differently - instead of simply doing your job well rigorously, thoroughly, properly and appropriately. Paint a vivid picture of the success that might be possible if the business does get behind your optimisation vision. Paint an even gorier picture of what's in the pipeline for the business if it remains passive or simply focusing on business as usual. Remember, sustainability and relevance are two of the biggest issues facing most organisations today so optimisation is likely to be an ideal solution to both. And remember that one of the biggest benefits of gender diversity is innovation - new ways of solving old problems - new products, new services and new markets. Most businesses aren't inventing new wheels any more. In fact, they're optimising and reinventing variations on old wheels. And just because it's always been done a certain way before doesn't mean it's got to be like that in the future. So once again, back yourself and your ideas and your willingness to solve things differently. You and your ideas might just be the secret weapon your organisation needs right now. In 2015 McKinsey reported that at a minimum $12 trillion could be added to the global GDP by 2025 if we advance women’s equality. So enablement can't all be bad. It's just the way that others think of it that's skewed. So help them to help you by reframing the perception and taking your newly rebranded 'optimisation' responsibilities seriously. 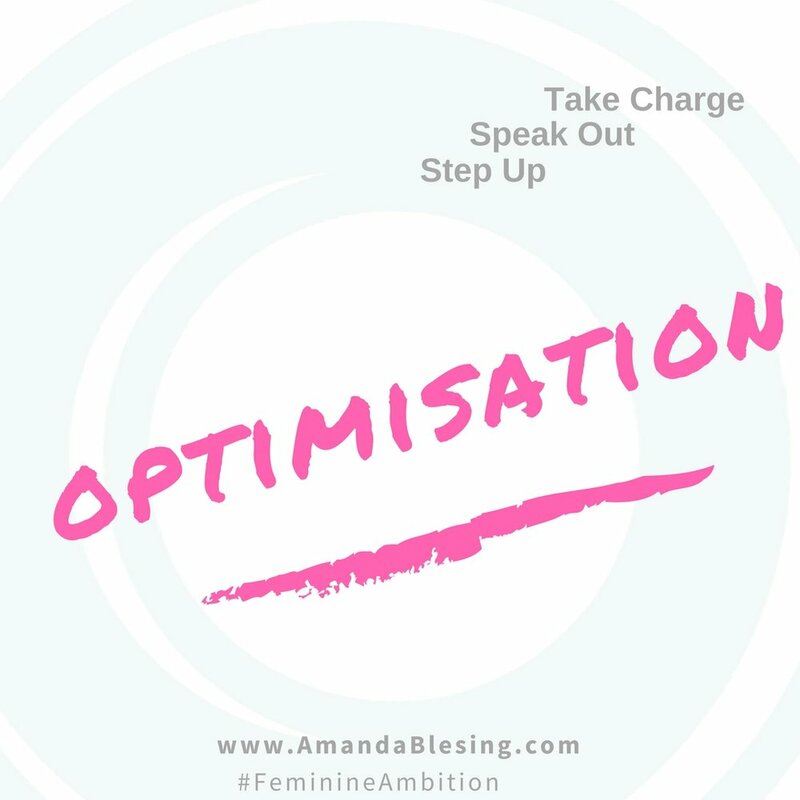 Do drop me an email if you've got a great case study or story about how you 'optimised' your business unit! Curious about programs on offer?